The mining of sulfide minerals poses well known and severe environmental hazards, including the release of sulfuric acid and other toxic materials. By contrast, iron oxides are chemically inert and non-toxic. One of the main arguments used to justify iron mining in the Penokees is that, in the words of Gogebic Inc. president Bill Williams, the Penokees contain “an oxide deposit, not a sulfide deposit” (http://www.youtube.com/watch?v=soHb2yPSNmI). While it is true that the target of the proposed mine is non-toxic iron oxides, the mine will uncover sulfide minerals in rocks that must be removed in order to recover the iron ore. As very little is known about the chemical composition of the rocks in the proposed mine area, it is difficult to estimate the amount of sulfide that will be uncovered. However, given the vast size of the mine, and what limited information is available on the chemistry of the rocks in the area, it is likely that the mine will expose enormous amounts of sulfide. Weathering of these rocks has the potential of generating more sulfuric acid than is in all the car batteries in the world. Release of this acid into the Bad River watershed could cause catastrophic environmental damage. (Madison, WI 2/17/2012) Proponents of AB426 want to change Wisconsin’s existing mining laws in order to permit iron mining in the Penokee Range in northern WI. They justify their efforts by distinguishing between the mining of oxides (sometimes confusingly referred to as ‘ferrous’ mining) and the mining of sulfides. The difference between oxides and sulfides (two mineral types) is not clear without a basic understanding of inorganic chemistry. First, some science. Iron-bearing oxides called magnetite and hematite are largely inert. Drop a shovel or push a car into a lake and it will fall to the bottom and rust without poisoning the water. By contrast, iron-bearing sulfides called pyrite (ferrous sulfide) are unstable on the Earth’s surface, where they react with water and oxygen to produce sulfuric acid and poison the water. Put a magnet in water and you can still drink it. Put fool’s gold in water and it’s poisoned. Unlike gold and copper, often mined from sulfide ores, the physical separation of iron oxide (steel on the hoof) from iron ore can be done without the use of toxic chemicals and without poisoning any water. Given this difference, mining proponents’ claim that the mining of oxides and sulfides should be treated separately is reasonable. Further still, a distinction between oxides and sulfides provides an objective context for evaluating the proposed taconite mine in the Penokees. As Governor Walker recently said, this is a matter of science. Science deals with questions, and this is a question for Earth science: What are the rocks made up of that will be mined in the Penokees? This empirical question requires proof and can only be answered by looking at the rocks. 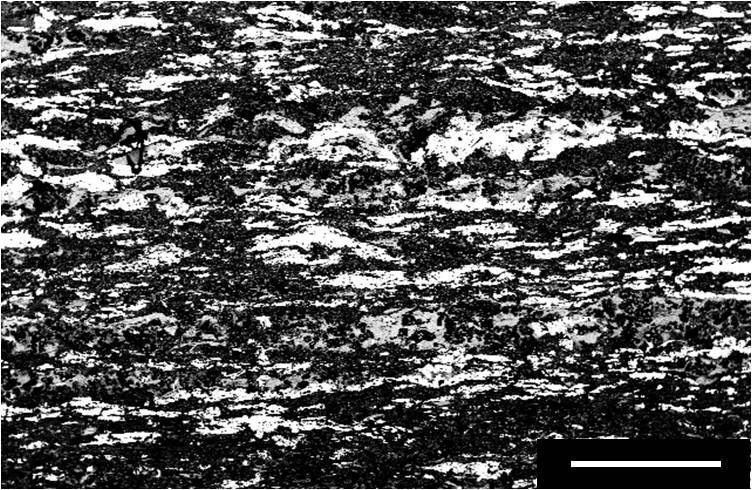 Electron photomicrograph of polished sample of the Tyler Formation. White color is pyrite while dark grey and black are mica and quartz respectively. Pyrite content in this field of view is about twenty percent. Scale bar is 1 mm. The proposed mine in the Penokee Range will cut through sedimentary rocks that formed approximately 1.8 billion years ago in a marine setting on the southern margin of proto-North America. The most important of these rocks are the Ironwood iron formation (the ore), consisting of layers of iron oxide and silica, and the Tyler formation (the overburden), which overlies the Ironwood and is composed of three rock types: shale, greywacke, and sandstone. We have endeavored to gather as much information as possible on the chemical composition of these units, and present our results here. Of particular importance is the pyrite content of rocks exposed to the surface by iron mining. Pyrite is the main sulfide in the Tyler formation and is the main source of acid mine drainage and other problems associated with sulfide mining. The association of iron ore and shale is not unique to Wisconsin. Temporal equivalents extend from northern Minnesota/Southern Ontario (Biwabik/Gunflint iron formation and Virginia/Rove Shale), across northern Wisconsin (Ironwood iron formation and Tyler formation) into the Upper Peninsula of Michigan (Negaunee iron formation/Michigamme Slate). Due to the long history of iron mining and difference geologic histories, the rocks in Minnesota and Michigan have been far better studied than those in northern Wisconsin. The only monographic treatment of the Tyler Shale of Wisconsin is a 1976University of Minnesota Masters thesis (Alwin, B.W., 1976, Sedimentation of the Middle Precambrian Tyler Formation of Northcentral Wisconsin and Northeastern Michigan: University of Minnesota-Duluth, 175 p.), which contains little information on the chemistry of the shale. There are no publicly accessible drill cores available from the region of the proposed mine itself. Such cores were taken by the US Steel Corporation decades ago. These currently are in the possession of the Minnesota State Geological Survey, which reportedly is refusing access to them. According to a spokesman for the company, Gogebic Inc. has not taken any cores of its own. The Wisconsin State Geological Survey has no cores from mine site. On a visit to the proposed mine site we were able to find numerous outcrops of the Ironwood on the north side of the Penokee ridge. Exposures of the Tyler, however, are restricted to the flanks of the Tyler Forks River and are covered by moss and soil. A good fresh exposure of the Tyler can be found about 10 miles East of Mellen where Hwy 77 cuts through a small hill formed by a resistant slaty area of the Tyler. We sampled this material (sample 1). We also were able to recover one small (ca 10 gram) fragment of black shale, presumably from the Tyler, in a small stream about 2 miles south of Mellen (sample 2). In addition, we were able to secure a piece of Tyler shale from a core taken along the Penokee ridge about 20 miles east of Mellen (sample 3). The Ironwood consists primarily of alternating layers of iron oxide and silica. The iron oxide is primarily magnetite, which accounts for the strongly magnetic character of the rocks exposed on the north side of the Penokee ridge. The sulfide content of the iron ore typically is close to zero. However, the Ironwood is not pure iron ore but includes layers of shale which often contain pyrite. Processing for taconite would separate this pyrite into waste tailings, where it would be vulnerable to oxidation. Pyrite content in iron ore from northern Minnesota is highly variable, but averages about 0.1%. Even with this small concentration in iron ore has caused substantial increase in the sulfate load in local lakes and streams (Bavin & Berndt, 2008). As hundreds of feet of the Tyler formation will be exposed on the north wall of the proposed iron mine, the chemistry of the Tyler is as important as the chemistry of the Ironwood that are the target of the mine. In black shales sulfides occur mainly as pyrite. Samples 1 and 2 contained less than ca 2% pyrite, the detection limit of our x-ray diffraction analysis. However, both samples were quite weathered, so that any pyrite originally present well may have been lost. Sample 3 (Figure 1) was approximately 20% pyrite, as determined by x-ray fluorescence. The amount of pyrite increases eastward from Bayfield County to the Michigan border. There currently are no data, or at least no data that have been made publicly available, on the pyrite content of the unweathered shales in the western portion of the proposed mine site. It appears likely that the eastward portion of the mine will encounter significant pyrite in its Tyler formation overburden. The sheer volume of Tyler Shale that will be exposed to oxidation means that even relatively low pyrite concentrations in the shale could produce enormous amounts of oxidized sulfur. For example, at 0.5% pyrite, a cubic kilometer of Tyler shale contains the equivalent of about 13 million tons of pure sulfuric acid, or about 10 billion gallons of sulfuric acid of car battery strength. The release of even a small fraction of this acid into the Bad River watershed could have grave environmental consequences. Moreover, pyrite frequently contains substantial amounts of toxic trace elements, such as selenium and arsenic, which would be released during pyrite oxidation. The amount of Tyler shale that will be exposed by the mine, the pyrite and toxic trace element concentrations of that shale, the amount of sulfate that would be released into the Bad River watershed by iron mining operations currently are unknown, yet these are all scientific, not political, questions. And they are questions that could be answered with the right data. In short, if we follow Governor Walker’s advice and treat the wisdom of the proposed mine in the Penokees as a scientific question, it is not a question that can be answered with current information. We do not know enough about the chemistry of the rocks that the proposed mine will uncover to decide whether the operation should be considered a sulfide or an oxide mine. However, available evidence points to potentially serious problems that could result from treating the Penokee mine as a simple oxide mine. The chemistry of all the rocks affected by the mine, and not just the iron oxides of interest to the mine operators, needs to be taken into account if we are to seriously consider the project from a scientific perspective. Thank you for posting this information. This would tend to explain the comments Sen. Bob Jauch made on the Joy Cardin radio program last week, when he stated that Gogebic Taconite had not made any test borings at the mine site (even though there is no regulation preventing such exploratory drilling), and instead has pursued the strategy of getting Wisconsin’s mining regulations changed. The citizens of Wisconsin are evidently being “played” by the mining company. Additional evidence of bad faith on the part of Gogebic Taconite, and on the part of their sponsors in the state legislature, is the structure of the royalty agreement. According, again, to Sen. Jauch, the fees for the ore will be paid as a percentage of the net profits from the mine, rather than per ton, or a percentage of the gross sales. As anyone who watches tv or movies has no doubt heard, if you don’t get a percentage of the gross, you’re being taken. Once the accountants have done their thing, your piece of the net could well be negative. the issue of sulfides in the rocks of the Penokees has come up again with this year’s renewed attempts to change Wisconsin’s mining laws. This article makes important distinctions between mining practices (oxides and sulfides), and acknowledges the important differences between the two. It also identifies the means by which the public is being misled, when a mine in the Penokees would uncover lots of sulfides, in order to extract oxides. thanks for making these important revelations, and clarifications.